Question: Write short note on Koch Curve. The Koch curve can be drawn by dividing line into 4 equal segments with scaling factor 1/3 and middle two segments are so adjusted that they form adjacent sides of an equilateral triangle as shown in the Fig. 16(a) .This is the first approximation to the koch curve. To apply the second approximation to the Koch curve we have to repeat the above process for each of the four segments. The resultant curve is shown in Fig. 16(b). The resultant curve has more wiggles and its length is 16/9 times the original length. Each repetition increases the length of the curve by factor 4/3. Length of curve is infinite. Unlike Hibert's curve, it doesn’t fill an area. It doesn’t deviate much from its original shape. Therefore for koch curve topological dimension is 1 but fractal dimension is 1.2618. From the above discussion we can say that point sets, curves and surfaces which give a fractal dimension greater than the topological dimension are called fractals The Hilbert’s curve and koch curves are fractals, because their fractal dimensions (respectively, 2 and 1.2618) are greater than their topological dimension which is 1. A complex curve can be constructed by repeatedly refining a simple curve. 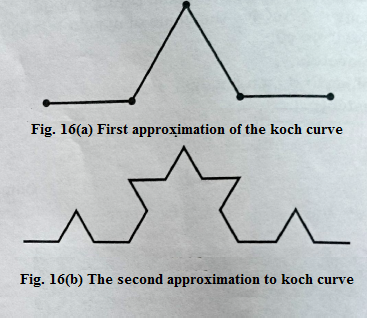 successive generations of the Koch curve are denoted K0, KI, K2….. . The zeroth generation shape K0 is a horizontal line of length unity. 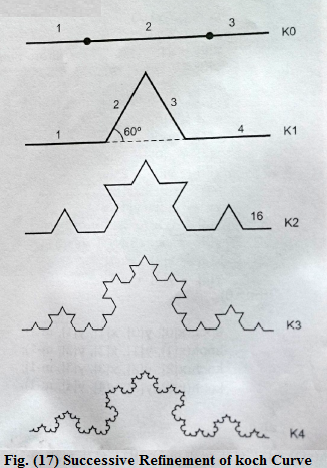 The Koch curve is a fractal that starts with a simple pattern made of a line that is divided into 3 equal parts. Erase the middle segment and replace it with an upsidedown “V” shape, and now the whole pattern is made up of four line segments. The total length of the line is evidently 4/3. Next, we do the same thing again. Each of those four lines is divided in thirds, and the middle segment is replaced with a “V”. There are now 4 x 4 or 16 line segments. Fractals are never-ending patterns made by repeating the same idea over again. So next, we'll replace each of the 16 line segments with the same pattern again. Each time we do this. the curve gets more jagged and complicated, and its length - or perimeter - gets bigger. The K1 curve has a total length of (4/3)i. Eventually, the pattern starts to look like a fractal in nature, such as a coastline, or part of a snowflake.